Our specialized teams work in tandem with each other to help us engage in the manufacture and supply of premium-quality Rope Hammock chair. They are made using superior-quality Cotton and are quality-tested by professional auditors before dispatch. They are light-weight and portable chairs which have a large carrying capacity. They have sturdy designs which enable them to withstand damage and strong impacts. These chairs are available to clients in different shapes, sizes and colors at cost-effective rates. They have a flawless surface which is highly scratch-resistant. We offer them to our esteemed clients within the specified time-frame at reasonable market rates. 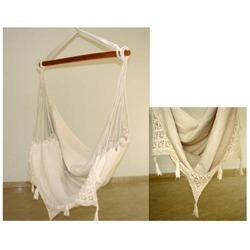 With an aim to stand tall on the expectations of our esteemed clients, we are providing Cotton Rope Hammock Chair. 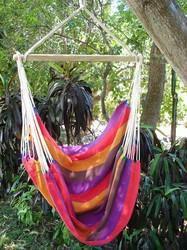 The offered hammock chair is a combination of luxury and quality, and this will last for many years. 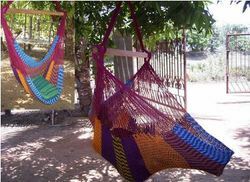 Our provided hammock chair is delicately designed as per with the industry standards of quality by our expert personnel using the finest grade fabric. Moreover, this hammock chair is specially designed to suit the classy tastes of our prestigious clients. 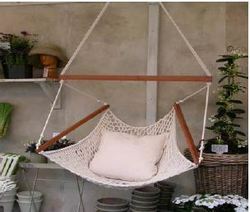 Looking for Hammock Chair ?